He was born on the 9th Sept. 1892 in Bristol. His parents were Ernest Lawes Usher, a brewer, and his mother Martha Ann Usher (nee Broadbent). His father was part of the Usher family who used to have a brewery in Trowbridge and also played for Clifton from 1897. His grandfather was Thomas Usher a Brewer from Trowbridge. He was educated at Clifton College from 1907-1909. He joined Clifton RFC in 1909. 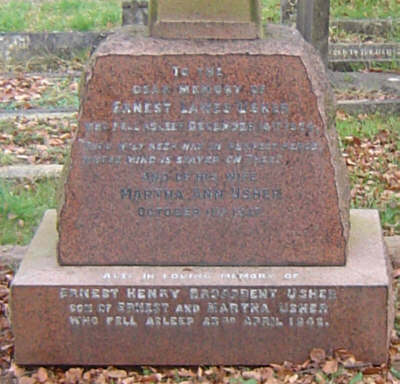 Ernest Henry Broadbent Usher Son 8 Clifton, Glos. On the 3rd April 1915 he was commissioned to the Royal Field Artillery, Special Reserve of Officers. From 17th April 1915 to 10th June 1919 he was battery Commander, 1st West Lancashire Brigade, Royal Field Artillery, Territorial Army. He was living at 121 Pembroke Road, Clifton. He became engaged to Enid Lee of Heathfield, Nailsea in 1919. 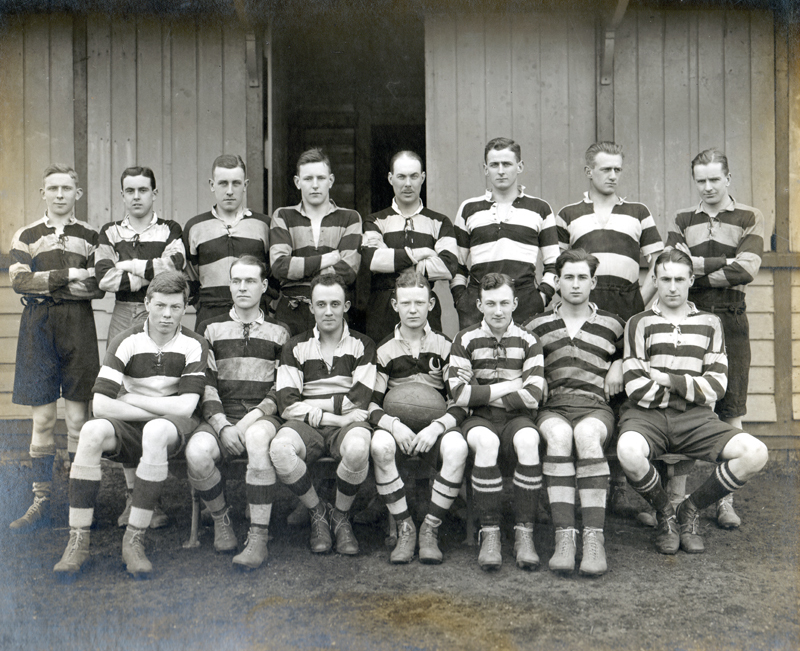 Back Row (L-R): J.G.Coole, K.H.Bain, W.M.Kendall, G.L.Gough, E.H.B.Usher, H.J.Goddard, W.J.D.McArthur, F.J.M.Cook. Front Row: B.J.Foster, G.A.Rose, W.G.Wheatland, E.C.Evans, R.C.Organ, F.G.Pratten, J.G.Gilchrist. Above Clifton 2nd XV in Jubilee year 1922-23 with Ernest Usher standing 4th from right. He became engaged to Gertrude Lynette Griffiths in 1924. She was the daughter of Mr and Mrs W.Griffths of Pencaemawr, Merthyr Tydfil. She was born on the 3rd March 1894 in Merthyr Tydfil. They married in 1925 at St. George, Hanover Square, London. Between 21st November 1928 and 23rd April 1942 he was Regular Army Reserve of Officers. His daughter Lynette Ann Gwenllian Broadbent Usher was born on the 18th September 1936. During 1939 he was a Member of the Standing Joint Committee for Ex-Service Questions. Between 1st April 1940 and April 1941 he was specially employed by the Army. Above the grave of Ernest Lawes Usher, Martha Ann Usher and Ernest Henry Broadbent Usher at Canford Cemetery. 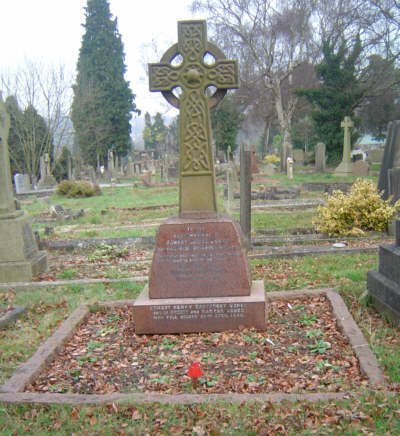 Above a close-up of the base of the grave of Ernest Lawes Usher, Martha Ann Usher and Ernest Henry Broadbent Usher. His mother died on the 11th Oct 1947 at 16 Brock Street, Bath. During the 1960s the Usher family lived at Roxhill House, Upper Woodford, Salisbury, Wiltshire. His daughter, Lynette Ann Gwenllian Broadbent Usher, married Captain Brian Donald Carr on the 11th May 1963 at Salisbury Cathedral. His wife Gertrude Lynette Usher died on the 20th September 1988 in Salisbury, Wilshire.